Thirteen 8" X 11" wafer paper sheets printed with 155 assorted butterfly designs in hues of blue and lavender,orange and pink, green and earth. Sizes range from 2" to 3" wide. Decorate cakes, cupcakes, cookies or any edible product with these beautiful butterflies. You will need to cut each butterfly out with a small pair of craft scissors. Note* All edible items, such as these, are non-returnable. Complete illustrated instructions for applying wafer paper to your cookies is provided with each wafer paper order. It is really easy and just takes a few steps. Leave yourself a bit of time for the process and cutting out the wafer paper designs. We recommend our No Fail Sugar Cookie Recipe. Cut out desired shape and after baking and cooling off frost with White royal icing (item #ROYAL7), let dry and adhere with a thin layer of Karo Syrup or our Clear Writing Gel (item # 9999CKGL1). What is Wafer Paper? Wafer paper is made of dehydrated potato starch, water and vegetable oil. The thin edible paper is then pre-printed with food-safe dyes. Wafer paper is tasteless and does not "melt" into the frosting, it will remain as a thin sheet of edible paper on top of your sweet confection. Click here to view or print our PDF file with instructions on how to apply wafer paper to a cookie. These turned out fantastic both times I have used them. 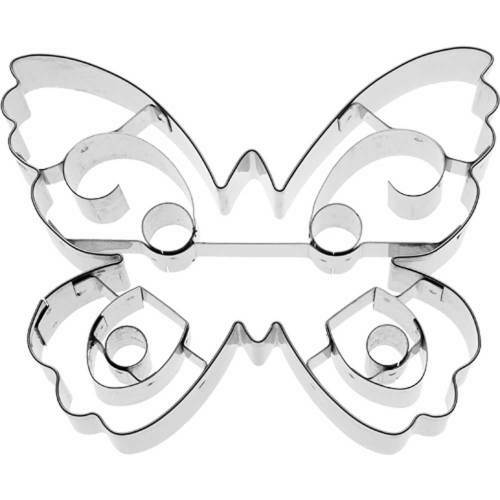 The first time, I made cookies using the butterfly cookie cutter set purchased on this website. I iced the cookies with royal icing in various pastel colors and then applied the butterflies. (There is a tutorial on the website.) Definitely dust them some disco dust to really make them 'pop'. The second time I made them, I used them on cupcakes for Easter. The cupcakes were iced with "Polish Family Buttercream Frosting" (on this website) in pastel colors and applied in a swirl pattern with a piping bag. 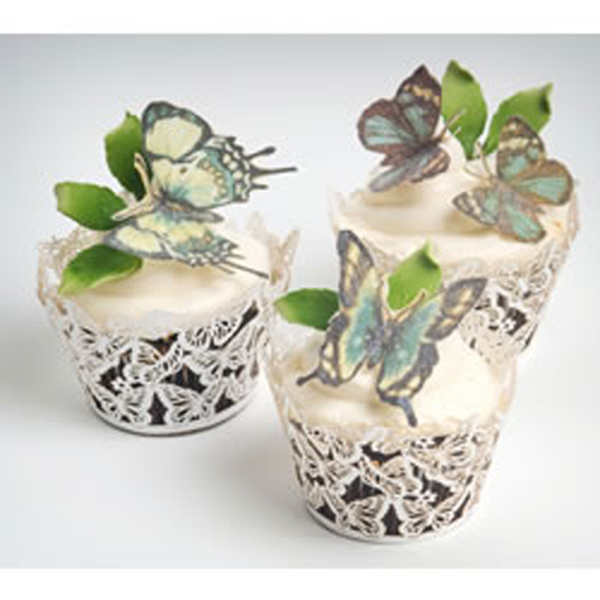 Each cupcake was topped with a butterfly. The only drawback is that they are extremely time consuming to cut out but if you are willing to spend the time, the final product will pay off. I would describe myself as an intermediate rusty baker. I used to do a lot of decorating and baking but not so much recently so I am enjoying getting back into it. I had not difficulty using this product. The cookies were such a hit that my husband's family didn't believe that I made them. Afterwards, one of their friends contacted me and wanted to pay me to make them for an event! These are worth the time! I used these on a wedding cake and at first I thought Oh wow I have to cut each one out but I set aside one evening and cut out four dozen in about two hours. I used empty egg cartons to set each one in to get the dimensional effect so they werent flat and it was easy to store them until I needed them. The overall effect on the wedding cakes layers was magnificent! I even got a couple of cake referrals because it looked so stunning. Overall these are well worth it! I bought these several months ago and felt a little overwhelmed by the amount of work that I thought using them would be. I finally dove in this week and they are really worth it. 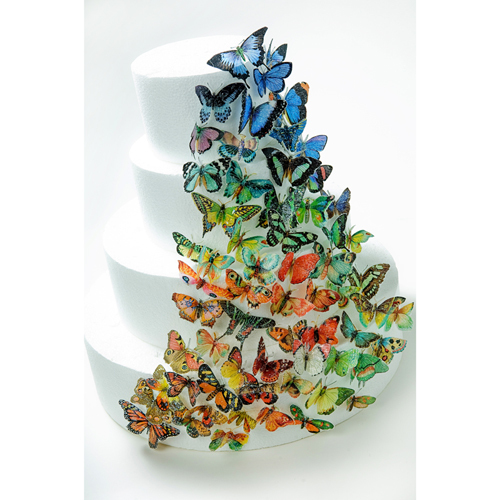 There is some work involved in pretty the butterflies for use on a cake. First you must spread a thin layer of clear icing gel on the images and let them somewhat dry. They take about five minutes per image to cut out, given the amount of detail in each butterfly. Then you need to gently fold the wings and allow them to dry fully before using on a cake. The results are worth it. I also added some disco dust to the images and this sends them over the top, but certainly not necessary. The colors seemed a little duller than in the images online, but once I did the thin layer of gel, they brightened up. They are quite lovely and very impressive. My daughter will have the best looking birthday cake around. The butterflies are absolutely gorgeous and so life like!